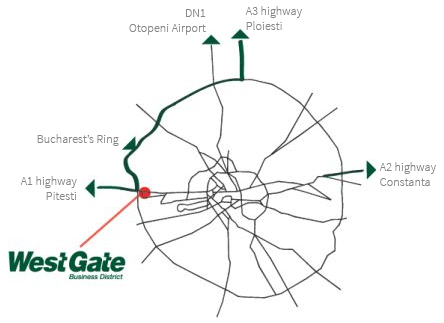 West Gate Business District is situated in the West side of Bucharest, with easy access to the city center, highways and international airport. The surrounding area offers a wide choice of retail shops, supermarkets, convenience stores and gas stations, as well as leisure facilities. The complex can be reached via a multitude of transportation modes, having two gateways on Iuliu Maniu and Preciziei boulevards. Subway station on the fringe of the site and more then a half dozen bus, trolley and tramway lines within 5 minutes walking distance. The location has a direct access to the A1 highway, Romania’s most important connection to Western Europe. The Henry Coanda International airport is easily accessible via the Bucharest ring, which can be reached within minutes.